Phillip Vardiman, director of the university's athletic training program and an associate professor in the College of Human Ecology, was named as the 2016 Kansas Athletic Trainer of the Year by the Kansas Athletic Trainers Society, or KATS. This award will be presented to Vardiman at the annual symposium on March 18. Those chosen as Kansas Athletic Trainer of the Year are certified and licensed athletic training health care professionals who encourage, advance and improve the athletic training profession — and promote sports health and safety. Mark Padfield, president of the society, said, "Vardiman is committed to developing students and building the resources available to the profession from a research standpoint. He does so much to ensure the future of athletic training." 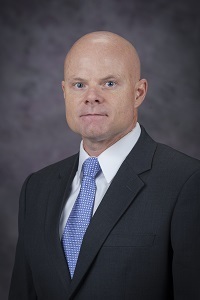 In 2016, Vardiman served as an athletic trainer with the medical team supporting the U.S. track and field athletes during the Olympic games in Rio de Janeiro, Brazil, and was an integral part of a K-State team who coordinated training, diet and workout recovery for five Fort Riley soldiers competing in the Best Ranger Competition. Vardiman takes his responsibility for educating the next generation in stride, always seeking out avenues to elevate the athletic training profession. He is a previous recipient of the National Athletic Trainers Association Athletic Training Service Award due to his years of service to the profession of athletic training at the state and district level. He talks scope of practice, new developments in the profession and industry possibilities to his students, university administration, state legislators and even parents of athletes and college recruits. In addition to teaching, training and traveling, Vardiman keeps his athletic training skills sharp with ongoing commitments, not only to Olympic-level athletes, but through his involvement with the National Football League's Athletic Training Spotter Injury Video Surveillance Program. He's currently funded through a grant from the Office of Naval Research in which he is exploring optimal training intervals for the Marine Corps' martial arts program. Vardiman's also researching whether instrument-assisted soft tissue mobilization can ultimately alter the muscle architecture and provide increased range of motion and function in patients. "As athletic trainers, I think most of us are used to practicing behind the scenes," Vardiman said. "It is an honor to be recognized by KATS."